It is now 10’clock on Thursday morning and raining. I am certainly not going out in the wet and cold to lead this weeks Thursday Ride. Still it could be worse, it could be snowing! It was last year. This year it has been stormy winds, lots of rain, flooded rivers and roads. You may (or may not!) find it interesting to see how weather conditions have effected Anerley B.C’s riders in earlier years. How about in January 1891. Yes that is 1891, over 120 years ago! Those who know a bit about our historic club will be aware that the earliest days – circa 1881 to 1930 – were recorded in a memoire by G.H Smith, an earlier club President, Captain, and Editor of the Anerley Gazette. G.H was a very famous cyclist in his day. He was chosen as the subject of the second in a series about cycling greats. This is the item heading from the “Cycling” magazine dated 1st November 1917. G.H was a prolific writer about cycling and we are fortunate that some of his words are still available to us. His memories of these early days were aided by the cycling diaries that he kept. We are again very fortunate that a copy of some of these, covering the years 1891 to 1897, were given to us by his great grand daughter. So what does G.H have to say about the wintery month of January 1891? Well, not a lot! Only two rides over a weekend, making 36 miles in total for that month due to the icy conditions. He tells us that it was very cold, with hard frozen snow. Even the River Thames was frozen when they got to Thames Ditton! His Sunday ride was to Riddlesdown. We know from his notes about the early history of Anerley B.C, that this would have been to the Rose and Crown pub on the Gostone Road. A popular club venue in those early day, the pub was demolished about 3 years back and replaced by a block of flats. On this occasion he was riding a machine shod with solid tyres. But with the icy conditions in mind, was it a bike, trike, or perhaps even a four wheeled quad bike? On the Sunday ride it was a tandem, this being fitted with the recently introduced pneumatic tyres. From other writings by G.H, and the drawings shown in the headings of the Anerley Gazette, this tandem was probably an Olympia tricycle tandem. Much safer than a two wheeled bike on icy roads! See an Olympia tandem trike with lady passenger on left below. 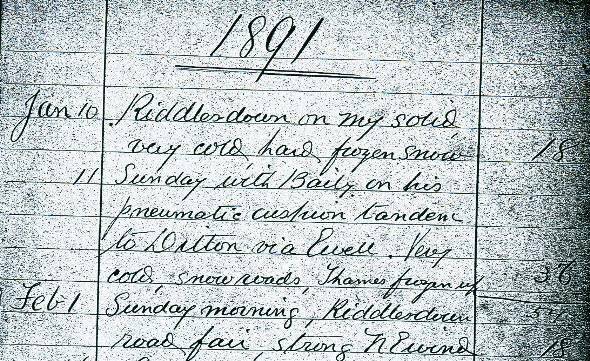 This January snow was not the last of icy conditions noted in G.H’s diaries. And if it was not snow, it was mud on those early, rutted cart tracks which served as roads in Victorian times and into the 20th century. If you want to learn more about the life and times of an Anerley cyclist, from G.H’s diaries, let me know. 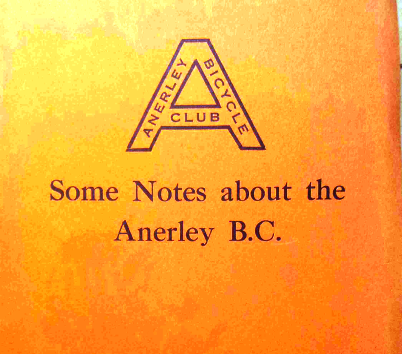 A copy of G.H’s memories of the Anerley Bicycle Club has kindly been made available by Dr Craig Horner of Manchester Metropolitan University. This can be down loaded as a PDF file, at http://88.96.181.108/craig/some_notes.pdf However I must warn you that it is a very large file (55 pages) and will take a long time to down load. Be patient, just make a cup of tea while you wait! this is very interesting des,i went out this morning but arrived late so had a lonely wet ride to the tearoom in westerham,still that’s 30 plus miles in the bank. just scanned through the book,very interesting read,i had my wedding reception in the George and dragon ightham,was so sad reading about calder the club captain in 1914,its a real history gem. Hi Mark, Glad you enjoyed a bit about our club history. It is just a shame that we do not have photos to illustrate the men, their machines and doings. And yes the sad death of Club Captain Calder in 1914 was one of the earliest of many members of the Anerley to be killed in action during World War 1. This year being the 100th anniversary of the Great War there will be lots on T.V and other media sources about this conflict and those who lived or died thru it. I have the full set of the monthly Anerley Gazettes for 1914, and these make interesting reading. Of course in January 1914 no one expected that war would be declared later that year. The January 1914 Gazette is full of expectations of a happy New Year. By autumn the Gazettes show a mood of optimistic patriotism. Clearly no one expected the bloodbath which was shortly to follow. Perhaps if interest is shown I can try to get some items from these early Gazettes reproduced for inclusion on our web site. yes that would be good,may bring some insight into what it was like to be around at that time. have you any idea where club captain calder was buried. Jack (our own John Jackson) did a lot of research into Calder, including visiting his grave (I believe in a war cemetery in France). After Jack died all his collection of Anerley Gazettes and much more was passed onto me. I have a couple of big boxes full and will eventually find his research records/notes on Calder..
ok thanks des,its a shame its in france would have liked to see it.